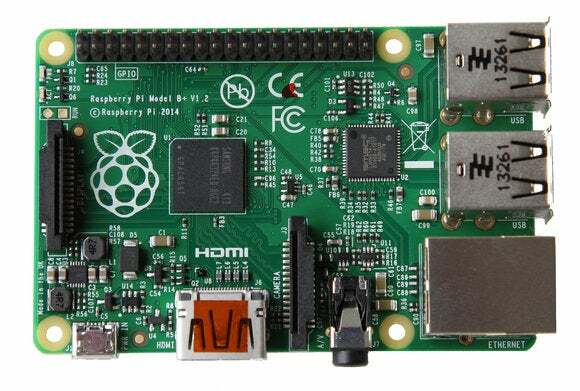 There's a new tasty treat in town for mini computer fans, and its name is the Raspberry Pi B+. Two years after the model B came out, the Raspberry Pi Foundation is back with a new revision that includes more GPIO pins, more USB ports, a microSD slot, improved audio, and lower power consumption. The new board is priced the same as the model B at $35 and is available starting Monday from many resellers. You can also order the new board online via the Raspberry Pi Foundation's two primary manufacturing partners: Element 14 and RS Components. The new Model B+ is not a Raspberry Pi v2, the Foundation said in a blog post on Monday. Instead, it's a final revision to the original Raspberry Pi board that includes the same 512MB of RAM and the same Broadcom BCM2835 SoC as the B board. For new stuff, the Model B+ now comes packed with 40 pins on the GPIO header keeping the same pinout mapping for the first 26 pins as the model B. Anyone using the Raspberry Pi for a quick media center or playtime PC will welcome the two extra USB 2.0 ports on the B+ bringing the total to four. That's right: This revision eliminates the need for a USB hub just to use a mouse, keyboard, Wi-Fi dongle, and USB thumb drive at the same time. The B+ also takes microSD cards instead of standard SDs. The new slot also has a push-push feel to it meaning it should behave more like the SD and microSD slots on other devices. That's a welcome change from the tight-fitting standard SD slot on the model B, which felt more like "jam in your card and hope for the best." Beyond port changes, the Raspberry Pi Foundation was able to reduce power consumption on the B+, and the audio circuit now has its own "low-noise" power supply. Finally, the model B+ has a new form factor and component layout that includes some fancy rounded corners. To keep regular B board fans happy, the Raspberry Pi Foundation says Model B will stay in production as long as demand exists for the now older board. It's not clear if the model B will get a reduced price, but taking a quick scan of resellers online it doesn't look like it—at least not yet.